The lady most people know as the President for over a decade of the Pittwater Community Arts is also an Artist herself, something visitors to art events in Pittwater may not realise as Lorrie is always on the desk or on the floor, looking after everyone else. When you ask her about her works you receive endless praise of other people's works and a Discourse on their Mediums that proves the lady is also a definite Lifelong Learner with a passion, an absolute passion for every art form there is. Lorrie genuinely loves others works; can rattle off their names, the work, the technique, where they were when they made it, what it is of – and should probably do a few lectures or talks; share the amazing amount of knowledge her curiosity has accumulated. Mrs. Morgan is also a person to whom family and heritage means a lot, and this has been extended into a family of Artists. I won’t tell you the year but a lot of feisty women were born that year- Bronwyn Bishop, Ita Buttrose, Marilyn Guion, Janice Tuynman and myself – and I’m sure there’s lots more out there. I was born the week that the Japanese submarine came into the harbour and bombed Sydney, while I was in Crown Street Women’s Hospital, just up the road. My father was up in Darwin, fighting the Japanese there, so it was quite a busy time then. Mostly at Bronte and Clovelly. My father met my mother on Bronte beach, he was a lifesaver, mum was a Beach Belle, so we’ve been on beaches all our lives. I also lived in the country at Gilgandra for a long time on and off, on a family property called “Breelong” so I’ve had a chance to live by the sea and the country a bit of everything, a good life really. What changes between the Bronte of your childhood and Bronte now are most significant to you? I don’t like the built up areas and the dog poo on the paths! You can’t park there any longer, there’s no room – I have lots of friends there still and don’t visit due to this. When I was a child I could walk anywhere in Bronte, I’m not sure that happens now, it was a lot freer or safer. These are reasons I love Pittwater, we still have that here and need to keep it as it is unique!!. Dad decided that we had to live out of Sydney and so moved us to a five acre property on the fringes of Sydney. There was a little bush school where third and fourth class was in the one room with one teacher and fifth and sixth in another. It was quite rural, there were cows and they were growing vegetables and fruit. I was there until 12 years old, did exams, and based on your results, you were then sent on to different schools; you either went to a Home Science school or others for different things. I was sent to a Language school. Here my subjects were Science and Physics and Chemistry and Languages; it was interesting and I really liked it but I loved Art the best. My teacher was Mrs. May. How old were you when you began dabbling in Art? I can remember my grandmother Alice Yabsley listening to the radio, because there was no TV in those days of course, and she was listening to Blue Hills or something like that, and I would sit on the floor drawing. One day she said to me ‘where are the bricks in the house? You haven’t got bricks in your house – I’ll show you how', and Alice drew the bricks for me. I was only about three or four then, but this taught me about detail. I clearly remember it still. One morning mum was making breakfast and we were getting ready for school, I was sitting at the table waiting for the toaster to toast and brushing my hair; I looked at the brush and it had a pink and cream handle, lacquered. I thought ‘that looks interesting’ and I used it to start drawing on the toaster – the toaster was hot and melted the lacquer; it was like graffiti when you think about it – did I get walloped for it though, oh my lord! I was lost in this world of drawing, it was working and I was having a ball, but I got into terrible trouble. How long were you at the Language school? Three or four years, this was an Intermediate school and you then went on to University or somewhere else. They wanted me to go on to Art school but we couldn’t afford it, so I had to get a job. My Auntie said to me, ‘you have to do Stenography – you can always get a job doing shorthand typing’. I went to Tech and I hated it, hated it with a passion, and I still hate it, can’t do it. To teach you they put a metal blind over the keys on the typewriter and I’d be leaning back, cheating, trying to see the keys; I’m just not that way inclined. It’s the same with knitting; I need to look at what I’m doing and am not one of those who can knit without looking. What was your first job then? I was working in Grace Brothers at Bondi Junction in the office – boring, I can’t tell you how boring it was! How did you keep the Art going? I painted every night. I moved back to my grandparents on my father’s side at Bronte, my Russian grandparents Fedor and Matrona Efremoff (beautiful people who spoke Russian at home), as there was no work where mum and dad were living, in the bush. My grand- parents were great but I was lonely, a 17 year old then, so I would paint at night; my whole room was covered in Art. I had decided I was going to be a millionaire, straight away. When I left home I took my tennis racket and my swimming costume because I was going to be ‘In The Set’ you know! (laughs). I thought, ‘you have to make money to do that’, so I had my day job at Grace Bros. and a night job in the local nursing home; worked all day and then went to the nursing home at midnight and was on a shift that finished at 6am there. I’d go home, shower and go to the other job. My grandfather put his foot down after a while, said ‘you can’t keep doing that, it’s ridiculous ’. After Grace Brothers I went to work at the Lotteries Office; I couldn’t type for peanuts. They had a huge table, a mile long, and all the typists would sit before these huge typewriters to type up sheets of cheques. Each person was allocated 25 a day to fill in with the names of the winner and their prize, and I was last on this table and never got through one a day, let alone 25! They all felt sorry for me as I was the junior and would take a sheet each for me, they were lovely women. I didn’t stay there for very long. In the meantime I used to go to a hairdresser at Bondi Junction, Hungarian people. Peter, their son, asked would I be their receptionist at their new one opening at North Sydney, I thought, ‘yes, I could do that, that’s better than typing’ and started there. While doing this job I got to meet Brian Henderson, who was on Bandstand then, and later our newsreader for many years. His girlfriend at this time as Hungarian and would come to the hairdressing salon. They asked me would I be guest hostess on Bandstand, which I did. I had to pick the best rock and roller, the best dressed rock and roller and hand the prizes out. I did this a few times. But I thought TV was a flash in the pan, that it would be here today and be gone tomorrow – I thought that about computers in 1980 too by the way! – I couldn’t see the potential in either….another opportunity lost. Before that, when I was growing up out in the sticks, you could learn to do Ballroom Dancing – I wanted to be a Ballerina but we couldn’t afford that, so I did Ballroom Dancing. Our teacher was Les Rushworth. He was quite famous in the Ballroom Dancing sphere, would run classes in all the different districts. When I was 14 he wanted to take me in his troupe to America to dance, dad said ‘no’. Les Rushworth was lovely, he had a big belly, a cigarette always hanging out of his mouth, would pull my hair back, saying ‘head up!’ and ‘smile, smile!’. It was funny but also taught me to smile; I smile all the time, I can’t help it. I loved Ballroom Dancing and when TV first came out they didn’t have many advertisements and would get us to come on as Ballroom Dancers; we’d be in the wings and they’d clap their hands; ‘you’re on!’ and we’d go out and do a Foxtrot or a Rumba, something like that. None of us were paid, we were only kids, but that was something you could do and quite interesting that they had this to fill in the time between the shows with people doing this – with whatever dance fad was it at the time. After Bandstand and receptionists work I went back out to Gilgandra to live and was Jillarooing – that was super, I loved it. I learnt to drive before I was old enough to get a licence. I had a boyfriend with a plane, a Chipmunk, who used to land on the property and pick me up and off we’d go around the Warrumbungle’s – we’d do loop-de-loop and belly rolls, spiral drops; pretty hair raising stuff. I joined the Air League when I was about 11 years old, everyone else joins the Girl Guides, but I joined the Air League. I had a great love of flying, had always wanted to fly; it was a means of getting somewhere, you wouldn’t be stuck in one place all the time. Whilst living in Gilgandra I got a bit bored and was looking at the Herald one Saturday when an advertisement for Air Hostesses was running. I was only 19 at that stage, not old enough for Qantas where the age limit was 21. I applied for the position with NSW Airlines, and got the job. I was the youngest Hostess at that time. I moved back to my grandparents again, was getting experience at NSW Airlines with the intention to move to Qantas when old enough. We had Flying Boats. On one trip I was chosen as the Hostess to take Sir Hudson Fysh to Lake Eucumbene for the inaugural flight to the lake. The Australian government had flooded a valley to make the lake at this time, you could still see buildings under the water and some bits still rising above the surface. Sir Hudson went trout fishing on the lake, caught lots of trout, and then we flew him back to Sydney. I took home trout for dinner that night, very nice. I had no idea then who Sir Hudson Fysh was, but do now. I met the most interesting people doing this job. I loved flying, went all over New South Wales. Ansett eventually took over NSW Airlines and our uniforms changed whilst I was flying. This was the most beautiful uniform, white with bottle green epaulettes and cap and tan shoes; very smart. In winter it was a dark green wool, all tailor-made, just beautiful, I felt like a princess when I was getting fitted. We used to have this trip called ‘The Carousel’ – it would fly out for the Saturday night to Hayman Island. The company asked if anyone would like to do this flight as an extra job and I put my hand up. They dressed us in mumus’ and leis with flowers, we would give everyone a tropical punch to farewell them on this wonderful trip they were going on. Airlines of NSW was a terrific airline to work for, they would give us trips as rewards for work well done and people would write letters complimenting us on the service or if you’d done something; such as resuscitating someone. Because they thought my friend and I were good Hosties they gave us a free trip to Hayman. Margo and I flew in the last Catalina in Australia on this trip to Hayman. We left from Mascot and flew to Hayman Island, refuelling at Brisbane along the way. Halfway up we started putting on clothes as we were freezing; they were not air-conditioned then, they were old war planes with the big turret on top; this had been demobilised but still had the turret etc. – it was freezing cold when you got up high and everyone would put winter gear on. When we landed at Brisbane we nearly died it was so hot, off came all the gear. Once refuelled we continued to Hayman Island and landed on the water just offshore. We all disembarked and had a great luau that night, a great party, everyone could party in those days, it was so much fun. When we got up the next morning the plane had gone, we couldn’t’ work it out. We got closer to where it had been, and there it was- the plane had sunk at least 20 feet the pilot had left the plug out!!. That plane was being sold to a wealthy New Guinea plantation owner; he was going to fly it around New Guinea. They did get it up out of the water, salvaged it after we’d gone. Margo, and I were on the island for a week, we’d sunbake and swim and they had a beauty contest - which I won, but couldn’t get the prize as there was only one gold lame swimming costume, a size 40, which was too big for me then, so they gave it to another girl – I was so disappointed! It was beautiful, like those Esher Williams used to wear. One evening we went into the bar. I was standing there and spotted in the bar mirror these guys down the end of the bar, all laughing, drinking champagne. There was this round face, blue eyes, all pink from the sun, and I thought ‘that looks interesting’. So I sidled up the bar a bit and there was Eric Morgan, who I eventually married. He’d been thrown off another island for being ‘drunk and disorderly’ – he’d been sailing around up there with his mates, just young guys out having fun on a yacht. They’d been kicked of South Molle I think, so just sailed around to Hayman and began anew there. He was with Warren Marks, whom Margo eventually married! The airline lost two good Hostie’s in one swoop!! They had two children, we had two children, we’re all still good friends, they came up for Eric’s 80th this year. I married Eric in February, when I was 20. Just before we married he was told he was being transferred to Western Australia, to be second in command of Woolworths in WA. Eric was the youngest ever Woolworths manager at the age of 19. We had our honeymoon in Surfers and then went to Perth. How long were you in Perth? Three years. I got a job as a Hostess with a hire car company, my job was hiring out cars, delivering them then picking them up. I left work to have a family and had my son Michael Anthony Morgan at St. John at Subiaco. After three years we were transferred back to Sydney and we built a house at St. Ives. We were there a few years, during which I was pregnant with my daughter Nicole, and we were moved to Melbourne, and Nicole was born in Melbourne. So, every time I had a child I was on my own, which teaches you to stand on your own two feet if nothing else. We lived at Glen Waverly while in Melbourne, a lovely place, but the only thing I really like about Melbourne was the Art Gallery. It was either too hot or too cold. Glen Waverly was the end of the train line, so I was in the bush again. I saw a documentary the other day on Glen Waverly; it’s overgrown now, has high rises, an amazing change. We came back to Sydney and bought another house in St. Ives. We lived on the floor of a valley there and I kept getting sick; head colds, flus etc. the sun would be gone by early afternoon. When I went to a specialist about this he explained where we lived was causing this, that I needed to move to a hilltop with lots of light and wind and sunshine. I came home and got the Herald again and saw this little advertisement for a place at Myola road, Bungan Beach. When I went to have a look and walked up the drive, the vista was just amazing of course and I knew we had to have this place. Next to this was the stone cottage, a classic English style building which had once been a huge conclave of Artists and writers called ‘Bungania’. They had cows and chickens. Bungania was owned by Alfred Gregory Yewen who had a daughter Wendy Yewen-Britton and Wendy had a son called Chris. I knew Wendy and Chris and Wendy taught piano. In 1980’s and 1990’s Bungania was a bohemian hideaway for artist’s, writers and philosophers. Our home was built in 1910 for two Miss Smiths, apparently someone in Manly was selling land to spinsters; I think that story was this was built for them to have if they didn’t get married. It was a beach house originally, then a famous musical family bought it off them. The lady who owned it when I went to have a look was Nadine Hansfeld, who had been married to Ray Price the Jazz player. Nadine was a writer who used to do Art reviews for newspapers and wanted to move to Hornsby as her daughter was doing a degree and the travelling back and forth all the time was too much. When I walked into this place there were these paintings as big as a wall over doorways, the whole house was infested with tarantulas as you get in a beach house; everywhere there was one she’d just blotted it so there were dead spider bodies all over the walls. It took years to get rid of them once we bought it, years. We redid the cottage, putting everything back as it was originally. We had to redo the roof as this had been blown off several times during the southerlies, we were 500 feet up in the air there. I rang Darwin after Cyclone Tracy happened there to find out how to attach the roof and cyclone proof it and that’s what our builder did. We added to it a little bit but kept it as a beach cottage, kept the big stone fireplace, the lot. What year are we talking now then? My children were teenagers, Michael had left school and began doing a shipwright apprenticeship at Newport, so he was 17 or 18 then, it was 1974/75. The northern beaches was very cheap to buy property when we moved here over thirty years ago, it was a really good buy. How did you increase your knowledge of the Arts; how did you find out what you needed to know? While we were still living at St. Ives, and my kids were at high school, Nicole at Ravenswood and Michael at Newington, I started doing China Painting. When I mentioned this to one of my friends at the school gate while waiting to pick up the kids one day, Adele Walker, she said that sounded like fun and wanted to come along. Maude Gibson was the teacher, who originally came from Denmark, which has so many great china painters and where the Royal Copenhagen "Flora Danica" came from of course, which Maude was teaching at Wahroonga. On one occasion when we were all sitting around this table painting(I was working on a whole dinner set to match a tablecloth), I said ‘ I’m going to rent a shop on the Pacific Highway and sit in the window and paint; people will see me and come in and buy what I’m doing’. Adele said ‘that’s a good idea Lorrie, let’s do that’. So we went and rented a shop at Roseville, which was in a lane, not on the highway as this was all we could afford, and started the Porcelain Art Centre. There was one other business in Sydney doing this, at Hornsby, who employed cranky people so others didn’t like going there which was good for us. When we opened our Porcelain Art Centre we became Importers and Exporters, Manufacturers, Wholesalers, Shop, Retail, Teaching Classes – you name it, we did it. We imported books from America and became sole agents for that, we would bring Artists out from all over the world to teach in our studios- ex-Royal Worster Painters Gerald Delaney and Milwyn Holloway, the top artists from America Pipka, Ronnie Bringle to name a few and also from Switzerland, we’d put them up and looked after them. It was a magical time to develop this new art form called Folk Art here in Australia. In three years we’d made enough money to buy our own land in West Lindfield and built our own building, a purpose-built Art Centre, which opened in 1984. We had a shop at the front, which generated rent for us and helped pay off the little bit we owed. We fired five kilns every night. We had a Wholesale business, a mail-order business, classes going day and night. Adele and I shared the day work and employed two people part time. There was plenty of parking, it was great. As we were doing porcelain somebody asked if we could do a porcelain doll. This became very big. The women were making the most beautiful dolls. I decided we need to have a Doll Show so people could see these wonderful works and what people were doing; it wasn’t just the porcelain part, it was the clothing and what they were doing with this too, they handmade everything. We started the Sydney Doll Show in 1983 at Sydney University. We were so inundated it grew so big in that first year and we moved it to New South Wales University and it was held in the Square House. This ran for 14 years. Everything we did was never for money, it was always for the passion and to show people what other beautiful things people can do and make. The Doll and Bear Show took off; we had a huge competition and had to fly judges in, went through receiving terribly rude phone calls about the judging, so changed that to anonymous judging, all these things that occur when something is such a success and people get very competitive. The stallholders would get upset if their stall was moved one foot to the left or right – just amazing reactions. People can get very stroppy (laughs). At any rate, from that, I got involved with television again, with TVSN, the selling station. They began selling dolls and bears, and had seen what we were doing and thought it was good. I ended up being on television selling their dolls for them as well as a guest Artist. They came and filmed the whole thing and then said they’d like to buy it. We hadn’t take a penny out of the business, but had simply put it all back into the next show. By then I’d sold the Porcelain Art Centre. Les and I went along to the meeting to discuss the selling of the doll and bear show, and Les said as we approached the meeting, 'this is what we make, this is all we can ask'. I looked at it and thought, that bottom line is a bit small, so when we got in there I doubled it and we got it. I will not say what Les said!! I bought a Wendy Woden painting with my part; I'd loved her work for years. I walked into a gallery and saw that painting that’s now upstairs, and bought it – guess what it’s called? ‘Breakfast at Lorries’ – it’s all those wonderful lorikeets on a balcony, breakfasting, overlooking Pittwater – such beautiful colours. It’s a glorious painting, I love it. The Folk and Decorative Artists Association – how did your involvement with this group begin? This group has been going for over 30 years. My involvement began there in the shop associated with the Porcelain Art Centre. A lady came in and asked if I’d get something like this book; which is Folk Art, what is called Toll Painting in America. We said we’d try. My business partner Adele was brilliant at writing and she wrote to those in charge of these and we became sole agents for all these books. Those by Jo Sonja are most well known, she is the top in this field and a very famous American Folk Artist. We went to America and to her studio and did classes with her. Consequently I started doing many trips to America, and most states in America, to conventions, and am still doing Folk Art. So opening that little shop in Roseville started these enormous shifts in your life? It moved me into working in Art full time. My knowledge has just amassed since beginning that. Many girls who did the china painting decided they should also do a degree in Fine Arts as a result. After they did this they lost their skills, their naive approach to doing the artworks and stopped. I knew, as much as I should do a Fine Arts degree, I really didn’t want to do it because I don’t want to lose what I have already. What I’ve learnt through finding things on my own, or having an insight through heritage – the Russian Masters for instance, all that gold in those icon paintings that I fell in love with as a child, has stuck and grown. Curiosity, about anything in life, is going to prompt you to find out more, to understand what it is and why it is. Everything I did opened another door; why wouldn’t I go through these doors to these opportunities? The Folk and Decorative Artists Association began 30 years ago, when I was still running the Porcelain Art Centre and we began importing Folk Art books. The president, Monica Foltin-Rupprecht, like many of the women who went into this sort of art from Denmark, Finland, Sweden, Germany and Russia, were practicing their art from their homeland. They were remembering all this beautiful work that they had in their homes in these countries, like Jo Sonja. After some years I joined to attend meetings, to learn what they were learning, wonderful art. Eventually I was on the committee and did a variety of roles, except editor and treasurer. I was Vice-President, I was President and every other role that needed someone to fill it. This is us painting with the Russian master Olga in the Blue Mountains. You can see Monica Foltin-Rupprecht in the middle here. This shows some of the Icon paintings I’ve done. This is ‘Girl with a Handkerchief’ and another ‘Firebird’ from a lovely fairytale; here a Chocolate box that you keep cards in. We used to have the biggest conventions in Australia in this art form. One we held at Penrith Panthers was wonderful; all the committee wore vests made from fake fur, a tail and a mask; we did this so those who travelled from all over Australia and New Zealand would easily recognise the committee members of they had a question of some sort. In 2002 we had a Folk Art Exhibition at the Manly Art Gallery called Art of the People: a living art. Every Artist had a country and interpreted these as a theme. We did large backdrops, 5 foot by 8 foot, and these were surrounded by a sample of the different works from these different countries; some of these couldn’t be hung of course, they had to be placed. There were some American ones; this had quilting and works from Amish communities. There was an English one; which included this canal boat painting by Robyn/Robin Brooks. My contribution was Russian of course; showing some Icons and other works. When we arrived to set this up Therese Kenyon was in charge, a lovely lady. We started stacking our work on the floor, as they do in Europe. Therese said ‘you can’t do that!’ but after we explained they had to be shown this way, she left us to it. This is some of the magazines we imported or sold; we'd collect them into one large book at year end. This is one of my favourites – the aboriginal story of how the waratah became red; in this two white doves that loved each other were flying when the female was attacked by a hawk. She flew down in among these white waratahs and her blood made them red. I’ve always planned to paint this story. In 2003 Lindsay Godfrey from Pittwater Council put an ad in the paper asking for Expressions of Interest to form a cultural group in the area. They had an initial meeting which I spoke at, then another meeting was held where a committee was formed. Jennifer Michalski became the president, Peter who became Treasurer and I went to Council to begin this. Jennifer moved on after 4 years and I became President. Initially we were asked to find out what was in the area; all the different arts and crafts. We made a long list of these. I kept a focus on the Arts as you can always open a show or create an event to showcase these. One of the biggest reasons we had to begin PCA was for insurance purposes; the insurance or an individual was too dear; people simply couldn’t afford it. Another reason was they wanted to show their work but didn’t want to have to travel to Hunter’s Hill or Hornsby all the time. They wanted something in the area. We also wanted to do this in a way that would encourage local Artists; people may not realise, but when you’re showing a work it’s like standing in Pitt Street at peak hour stark naked – that’s the feeling I get when showing my work, and I’m sure it’s a similar experience for many other artists too. You’re showing someone your soul. One of my Art Teachers, a Mrs. Brown took us into the NSW Art Gallery one day, we were looking at Modern Art and I stated I could never understand it. She said ‘you have to go below your subconscious’. I looked at it, looked back to her, said ‘do you mean I have to be unconscious?’- boy did I get into trouble for that! So the PCA was there to address any cultural things people wanted to do. The Ceramics Show that happened at Pittwater High School in 2012 is one example of this. Chrissy Holland approached us and said she wanted to do this and already had the Education Minister in full support so schoolchildren would be included. She had a great prize lined up in solar heating. Chrissy had never done anything like that so I helped her work through the steps it takes from beginning to end to run such an event – the forms for people to apply to be in it, how to set up the room, what happens opening night, all that goes into these shows. This was the best ceramics show I’ve been to - wonderful works. Chrissy and her husband worked so hard to make this a success. The Avalon Art Exhibition and Sale has gone for over a decade – why has it lasted so long do you think? This is for the community, we don’t take any commission, and people know that…. this is what was behind this show from the outset and how it remains. They only had to pay for their space and we supplied the screens and the hanging system, the opening night and everything else for that one figure. The only charge on top of that was if the sale had to go through my Eftpos machine as I have to hire that each year. This was 5%, a lot less than the usual 30-35% you pay at any other Art Show. The first one was hard of course, we had to hire the screens from one of the schools and arrange to transport those. Meredith Rasdall, who at that time was running the Children’s Art Festival, was on our committee, and she had a lot of insights as to how to use the Avalon community centre, so that was a great help. Katherine Roberts was on our committee, the Manly Art Gallery curator. We’ve had some wonderful people coming along with ideas. This show has been booked out every year and grows more popular. How do you curate a show like that? We don’t curate that at all. The person bringing their Art in is responsible for their space and how it will look. We tell them when they’re applying and get their space what size it will be. I recommend they then measure that on the ground, place their art in it and look at how it will be. We show them how to hang it, and will help them do this if they can’t do it, but if they can we leave them to do this so they’re learning how to do this as well. The only curation I’ve ever done is knocking back one that was inappropriate – we get a lot of children that visit the Art Show and will not display something that’s inappropriate – we want them to come in too. People have reacted to us not curating it but it’s not about that, it’s about the Artists taking responsibility for their works; this is part of it being for the community of artists here. Besides, I don’t consider it’s my position to decide what or how things should be displayed – my opinion is just my opinion and all Art is different; whose to say what’s good and should be up front or something else? ; certainly not me. I remember when I was teaching Art at Newport years back at a shop that we my daughter and I ran called ‘Artistic Pursuits’ and one person had painted something this peculiar purple and I remarked to her ‘why did you paint it this colour; I’m not sure it will sell …’ and of course, the first show she put it in, it sold! So, who is to say what others will like or who are the best artists or what will sell? I decided then and there I would never say anything about anyone else’s work ever again – ever, ever, ever! What makes the annual Exhibition and Sale such a success? Well, number one; we don’t criticise people, we’re nice to work with. Debby Waters is always there to help; and is great at getting up high if people need help to hang works higher up in the display area. Debby has been a guiding force behind that show, one of those very hard workers who never wants to be in the limelight. Debby is one of those amazing people who just gets it done and will be taking over running this under her business Mixed Palette as she has the insurance. How did Artistic Pursuits eventuate? I opened this with my daughter; she ran the shop and I did the teaching. We sold stock; brushes and materials, and we also got to know everyone – it was a great experience. This was Decorative art and we had all ages coming; children, adults. We also did Silk Painting and I became agent for Marie France Silk Paints, and a silk importer through doing that and taught at a lot of TAFE Colleges through doing this too, it was great fun. Mrs. Brown is one of your early tutors – have there been any others? What are you learning after decades of being neck deep in Art? Everything. They’re all focused in one medium or another and I will go from one to the other – there’s always something else I want to learn about. I’m a bit of a ratbag in that too though as I go to another before I’ve finished one- very naughty, so I do have some, as you can see here, that will need to be finished. Some of these I did while in America- that chicken with the dwarf, a naughty dwarf – that’s quite an old traditional form that painting, is called ‘Tomptee’. That’s from a Jo Sonja class I did. I’ve loved doing Mosaics, even Rock Art – I’d love to start teaching people how to do those; this is something for young and more mature people who want to do some art. You get a rock and paint it: this one is a fox, and a leopard – it’s so good for children, they can adapt what natural features the rock has to some animal, or something else. Great fun. These were done with Angela Morris and for the Panthers Convention; each person attending received one of these as a gift- they were holding down their serviette. This is called ‘smooshing’, it’s an American painting technique which is using a short fat brush and you smash and push the paint around. How many works have you created then? I’m not sure. That shelf there with all those folders is most of the records – I’ve sold nearly everything. I just put them out there and hope someone buys it. What about this series of clowns here? This is the last series I’ve just done. There’s 10 in this series, all famous clowns from America. During the 1930’s and 1940’s circuses were big business; there was no television and no movies apart from the black and white ones. These clowns were as famous as the movie stars. So here we have Helter and Skelter, Flim Flam, Willy and Nilly, all these names you would have heard used in other places, in movies or in now famous phrases; ‘you’re going like Helter and Skelter are you?’ for example. In their heyday though, these clowns were stars. Helter and Skelter used to tumble, do all those kinds of acrobatics. There was a famous Artist called Julian Ritter who did the original paintings. He began by painting wonderful voluptuous nudes but couldn’t sell them. He got a mad idea when in Las Vegas, during when they were building the first casinos, and took the nudes to show them and they loved them and was an instant success– they suited their style to show in the casinos…..and then he went on to painting clowns.. So I’m copying his idea but I’m not painting like him. His work is loose, but because I’m an icon painter, everything has to be perfect; an apple has to look like an apple, a tree a tree very tight type of painting. Why are you an Icon Painter? I don’t know. It’s what I’ve trained in mostly and of course what I’m interested in due to my Russian heritage. There’s many books I’ve collected here which have allowed me to find out more, some of these have returned to Australia with me from overseas trips. Among this library are others on Folk Art, Mosaics, every medium of Art I’ve wanted to learn more about. So these are the Icons; and some here are those you saw in that picture form the 2002 Manly Art Gallery Folk Art event, Art of the People: a living art. This is ‘Hinterglassen’; which is painting backwards onto glass, which is another style of Icon. This one is made from shell, real mother of pearl beautiful shell. These smaller ones have tiny brush strokes. I was fortunate to go to Russia recently with a group of art friends, there were 8 of us and it was fabulous. We hired a kombi in Russia, and a driver and a bodyguard. The 8 of us crammed into the back of this kombi with all our suitcases and went to all the villages where they teach the different styles of Russian painting; Shostovo, Fedoskino, Palekhi, Khoulul and Mstera. We all thought we had died and gone to heaven being surrounded by the beautiful artwork everywhere. Each village has its own style. We went from Moscow up to St. Petersburg - on to Finland, we went to six countries on this trip. These beautified many of the Russian churches, as they do in Spain and other places Icon paintings appear – were you religious as a child? There was no Russian church here when my grandparents first came to Australia. My mother was Church of England, so that’s my church. I was a Sunday School teacher when 10 years old and I do go by the Ten Commandments, I can tell you that right now. You have received many awards Lorrie to recognise all the service you have done for the community and for others – which was the first you received? One early one is this from the Cancer Council – a Community Service Award. My early mentor from the China Painting era had a son who was diagnosed with cancer. 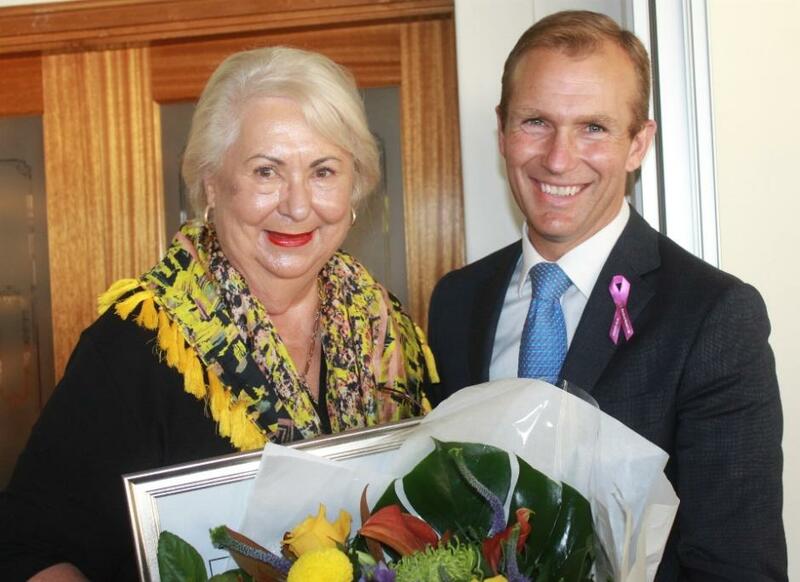 She taught us to give 10% of what we made from this to the Cancer Council to fund research – so of everything we ever sold this percentage went there. The Cancer Council asked us to come in for lunch one day and while there gave us this award. All this is part of learning too; you learn to give. This is from the 2002 Manly Exhibition with the Folk and Decorative Artists Association. I was the President at that time and that’s what we went forward with then. This is the Golden Brush Award, they give you a solid gold brush, (FDAA). The Australia Day Pittwater Citizen of the Year (2012) and Pittwater Woman of the Year 2016, and commendation at the Australia Day 2016 recognitions are here too. 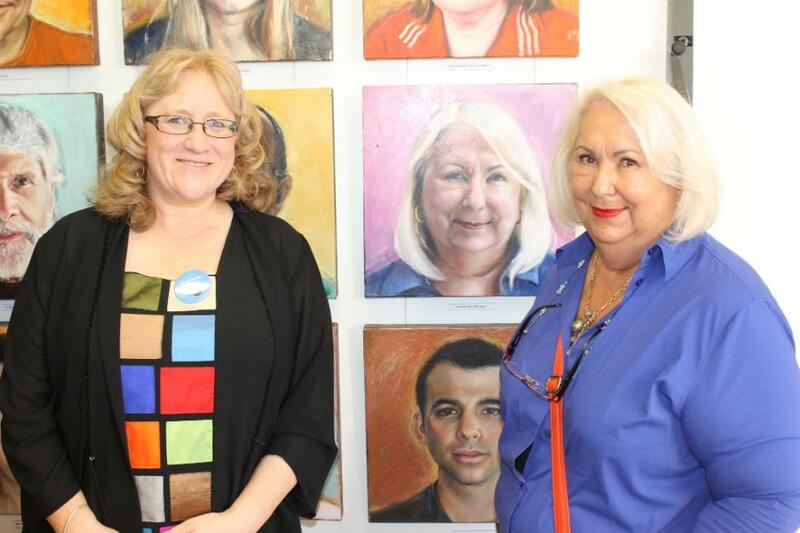 Lorrie featured as one of the portraits in Stephanie Galloway-Brown's FACE OF EXTRAORDINARY: VOLUNTEERS Exhibition and book - Stephanie and Lorrie Morgan with Lorrie's portrait behind them. Out of these, which means to the most to you? Every single one of them means something special to me; they’re all from different spheres and times in my life. Every time this has happened I’ve been ‘oh my god’ – you don’t expect it or do it for any reason to receive anything. I’m not sure what it is, people must believe in me I guess. Actually, that reminds me, bring your camera; I want to show you this. I used to help with all the big shows we’d have at Darling Harbour. One year everyone had to find something old and paint it for a guessing competition as to what it is, write this down, and if they got it right they won a prize. This piece I found at Narrabeen junk shop, the one that burnt down, and the technique I used here is called ‘Intarsian’; which is making it look like wood inlay. So; what do you think it is? An old sewing cabinet for a sewing machine? Oh Lorrie, good grief! You’ve made it beautiful, what a wonderful object. Lorrie: And, it’s got a penny in it! In the original pot!.. ‘spend a penny’! Only one person guessed it, a lady from Wahroonga. A sculpture. I went and did a class with a wonderful sculptor we have here in Pittwater, Michele Petrie, and this is what I’m developing at present. He is called ‘The Birdman’; he is a Russian gentleman I used to know, Mr. Smirnoff, who was a bootmaker in Clovelly. When this is finished he will be in Verdi Gris – a bird will sit up in the tree when it’s done, and a shirt will be plastered so it sits down. Behind you is something I found which I’ll adapt – he will sit on a table or pedestal before this, the birds will be painted Verdi Gris as well and candles will be lit in each of those candelabra stems. This is another sculpture, she’s called ‘Little Red Rooster’ and won Third prize at the Royal Easter Show around 4 or 5 years ago. This was my first attempt at mosaics. See these three fish here? I bought these to remind myself of the beginnings of the Pittwater Artists Trail – this is Linda Haig, Meredith Scott and myself; we were three little fish swimming upstream. Who are your favourite Artists; not living Lorrie, the list will go on forever? The Icon painters, but most of these don’t have names. In Russia, in the church, you don’t have seats, you stand through the whole service and ceremony. There’s no organs, no music, this is provided by the voices of the choir who sing; just magical sounds. My grandmother too, Alice Yabsley, because she was the one who showed me how to draw bricks and introduced detail; that everything begins with looking at the details. 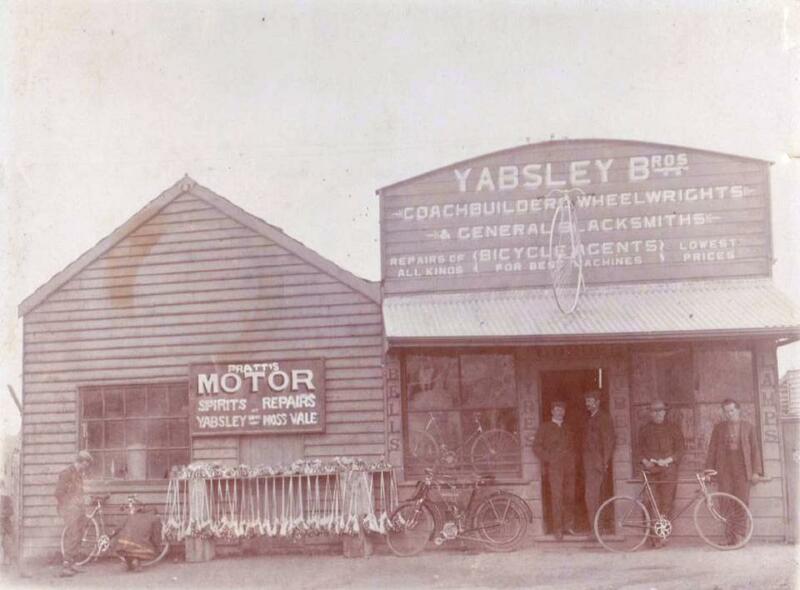 The Yabsley’s owned the Penny Farthing shop in Moss Vale – I have a photo of this. There was a gentleman named Michael Robert Yabsley who was one of our Liberal leaders; who is a relation. My grandmother married Herbert Yabsley. All of Pittwater. But I must admit that I like living here in Newport. We’re right on the beach, see these beautiful sunrises and get those wonderful sea breezes during Summer. 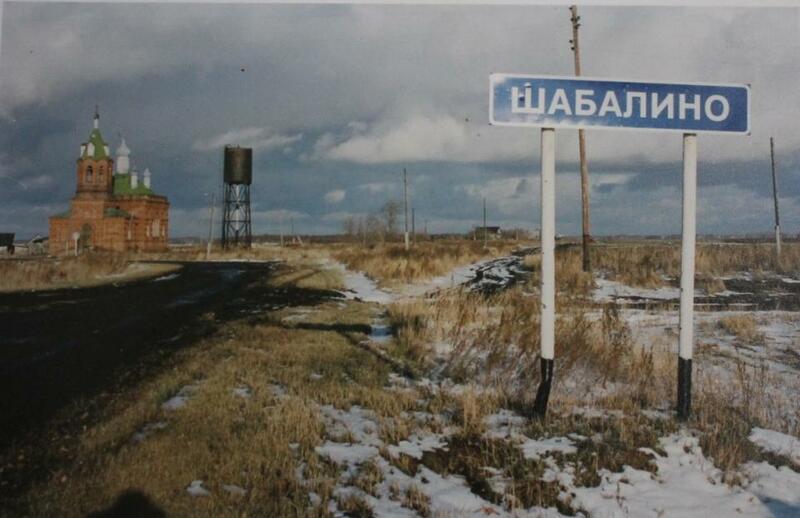 I also love Bungan too of course, we lived there for such a long time and it’s a beautiful place. I love the people here, love being with the people you find here; this is a great community. I also like those who come to visit us here, from every culture, all over Sydney, they too bring something special to our area in enjoying what we have here. It’s a happy place here and people recognise that I think. Thirteen-years-old Nicholas Efremoff, of Paddington Junior Technical School; is the finest all-round athletic junior in New South Wales — probably Australia. He definitely established that honor yesterday at tho sports of the Public Schools' Amateur Athletic Association on the Cricket Ground, when he swept tho board of events for which he was eligible. "Nick" won the Junior championships of 220 yards, 100 yards, the high jump and broad Jump — no mean feat for a lad in one day, when heats and other races in which lie competed are taken into consideration. No wonder the sportsmaster of the school (Mr. Cameron) remarked this morning, "He may he too tired to come to school this morning!" But he wasn't! However, Efremoff is a sturdy lad, big for his age. And thereby hangs a tale. He was born at Broken Hill, on January 1, 1917. Had he seen the light a day earlier Efremoff would have had to compete as a senior. Thus he has the full advantage of a year, while most of his adversaries would be some months younger than he. At the school sports recently Efremoff won every event for which he was eligible, and last year won his age championship at the big sports. His prowess is not confined to the athletic field, for he won his age championship in the last P.S.A.A.A. swimming events, and is a member of the school first grade football team. As a cricketer — well. "Nick's" not so good !